As well as any meeting between elite supergiants the today's games will not give a rest to the commentator :) as well as to the spectators: Anand-Kramnik (here one desides the question who is more Champion), Morozevich-Adams (here is a disput who is the 4th in the World), Topalov-Leko (here is a disput... who will be...). So, don't wait a quick draws. The Russian Game - here nobody can dispute with Vladimir - a draw is the most expected result. Morozevich-Adams (A28). The English opening against the Englishman - well, Alexander! A wonderful day - passed an hour of the tournament time but on the no one board one had made more than 15 moves. The triumph of the mastery to "go away" from the rival's home analysis! Kramnik choose not the most popular variation 8...Nf6 (last time usualy play 8...Bg4). With this variation I have found only 5 games - Black gained 50%. 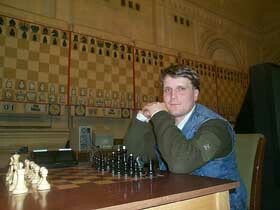 Between elite chessplayers the position has met in 2 Jusupov's games: Topalov-Jusupov Moscow ol 1994 1/2, comp Rebel-Jusupov, Ischia rapid m 1997 1/2. But 11.Я5 was only once - comp Genius5 - comp Fritz5, Debrecen op 1998 1/2! The computer gave away the Bishop 12...Bc5 - launching a trade combination - White gained two Bishops in result. In Dortmund one don't give away the Bishops - how it is possible? - the Hindus ride them from childhood! 12...Ne4 - in any case firmer. Now is an independent swiming... Anand has got nothing- after 16...a6! 17.a3!?? was fixed a draw! These fighters will not drawn so easy. 4.e4!? - this move besides that is externally unusual also is rather not so simple. If Black tries to capture d4-square with 4...Bc5 then follows an irrational 5.Ne5!?! - and whether Mikky needs it? The Englishman should "creat". It means that he will do it accurately: 6...h6! ?, 11...c6! ?, 13...a6 - is it not an overdose? Morozevich is going attack on the Kingside - Adams undermines by 16...b5 on the Queenside - the situation develops in Moscower's favour. Usually one gives him no to "prepare the attack". Now at least it's possible to go ahead - 18.Nf5 - Russia belives in you Alexander! Nevertheless the New Indian Defence Hindus plays better! :) Leko has learned all far away and learns to play in big chess. Topalov already played a lot in big chess and still coachs... Two Anand's "learners" (or somebody else from the "big trio"?!) today sparringed in a measured tempo... The variation 4.g3 Ba6 has not changed its valuation at all - if Black knows a lot - he will resist. Not the most popular move 8.0-0, and then a rare 9.Nc3 - 4 games in base after 10.Bf4. Peter hardly is well familiar with this variation - the position after 13.Nb5 has met only in two games of Vyzhmanavin. But the natural capability to find the super-firmed continuations rescue the Hungarian. The move 14...Nh5 (instead of known one 14...cd!? - (Vyzmanavin-Ilijin , Bern 1993 1/2) after 15.Bd2 Nf6 looks like a mockery - Black simply passed the move! Continue to play Morozevich and Adams. Wishing no simply to defence the Englishman sacrificed a pawn, changed the Queens and has a certain compensation in the endgame - White still has not coordinate his pieces and the pawns are weak... Adams has a skill to "jump off" the loss - one could suppose that the chances on a draw in this game is rather great... Endeavour, Alexander! The time control has passed - Morozevich retained good chances for a victory. An extra pawn, now already "bad" black King, a big distance by the black Knight from Kingside - it seems that Alexander in his own time trouble managed well. The f5-pawn suddenly becomes more dangerous then e2 one! Perhaps, Adams has lost the drawn chances with the last move before time control 40...g5. One couldn't see how Black may resist... In case of Moscower's victory the situation in the tournament changes slightly: Morozevich overtakes Anand and sends Adams to the last line of the tournament table. 48.Re2! finished the fight in the last game of the round. All is in future - there are no obvious leaders and outsiders. I wish good luck to Russians in the tournament! All the best - take care!